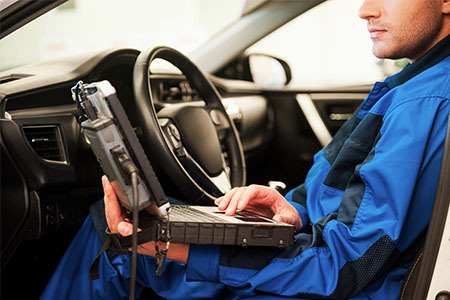 Our auto electrical specialists know that every year the technology for the electrical system in your auto becomes increasingly more complicated. The auto electrical system operates a wide arrange of components in your automobile, including the wiring and circuits, charging and starting system, mirrors and windows, instrumentation, lights, anti-lock brakes, and much more. If you are having problems with your car or truck starting and your troubleshooting has ruled out the battery or starter then the culprit may very well be the vehicle’s electrical system. Every technician working in our automotive service center is trained and qualified for a variety of your auto electrical repair needs. Our facility uses advanced electrical diagnostic equipment to locate, fix your problem and get you safely back on the roads! Auto electrical problems can sneak up on vehicle owners. Without warning your battery may die or ou may stall at a stop light. It is important not to ignore these signs. Perrysburg Auto Mall provides the electrical oversight and repairs you need to drive away with a fully functioning vehicle. Before you have your vehicle hauled in for repair, make sure the battery is not to blame. We offer electrical diagnostics to pinpoint electrical troubles over mechanical assumptions. Need a new battery? We sell and install a wide range of reputable batteries. We even clean your contacts and test power after every install, to ensure you drive away with peace of mind. A couple of crossed wires can cause an assortment of problems for your vehicle’s electrical system. If you have had work done recently and are experiencing problems, we will make sure that bad wiring is not to blame. We can check and replace the window motor and test the connection to restore up and down function. Let us check your locks and their mechanisms to make sure you are able to lock and unlock freely. Radio not working? Dash lights not displaying? We are likely dealing with a blown fuse. We replace fuses and route the source of the failure to ensure everything stays working properly. Alternators can cause a variety of problems – including the starting of your vehicle. If your engine is not turning over or the battery light is on, let us check for alternator trouble and provide a replacement if it is found to be faulty.